I’m actually way more of a big soppy romantic than I’d like to admit. 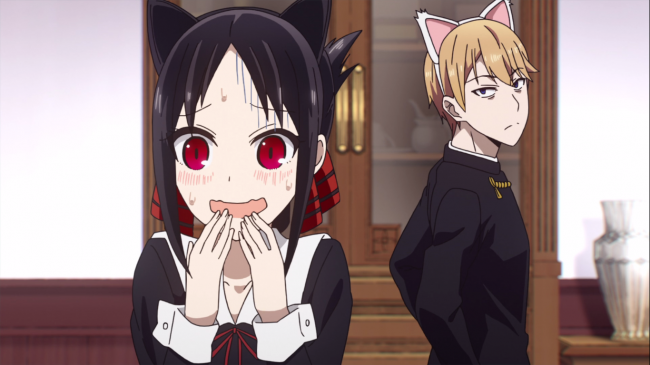 Which is why, when I started watching Kaguya-Sama: Love is War as a goofy comedy featuring two of the most extra people you’ll ever see, I never thought it would grip me to the point where the ending almost had be blubbering like a baby. And then it went and pulled the rug from under me, went on for another ten minutes and plopped me and all of the characters back to where they started. In essence, ripping my heart out and throwing it around the room before hastily applying a few band aides and returning it with a red face and an apology. Kagyua sama was a show that managed to hit me in all the right places. It hooked me in with it’s high concept silliness, pitting two ridiculous characters against one another in a battle of wits. Cranking up high school romance to that of a expert level poker game. Beginning the series with two over achieving-privelaged teenagers stroking their egos. Which would consistently blow up in their faces thanks to the agent of pure chaos that was Chika Fujiwara, bringing down every well laid plan like an adorable, pink hurricane. But then something changed. Cracks started to appear in the well crafted facades of Shinomiya and President Shirogane. The core of what kind of people they really were started to trickle out, little by little. We learned that these two student’s who had placed themselves high on a pedestal where both good people, and were utterly smitten with one another. As the series went on, the focus became less about the characters as over the top stereotypes and started treating them like real people, with anxieties, fears and desires. 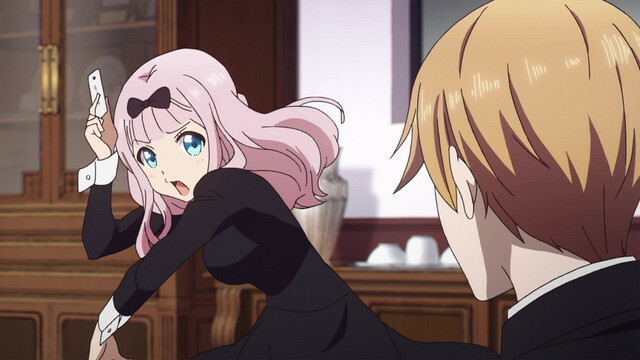 The character work in Kaguya-Sama is what really ended up investing me in a deeper way that a simple comedy could have. There was something about the incredible earnestness of the characters, despite being placed on pedestals by everyone around them, seeing their pure desire to be with one another made me want to wrap a caring arm around both of them, tell them it was going to be alright. And then bang their heads together. The teasing, will they/won’t they story trope is a well worn in most media, especially in anime as far as I’ve experienced it. 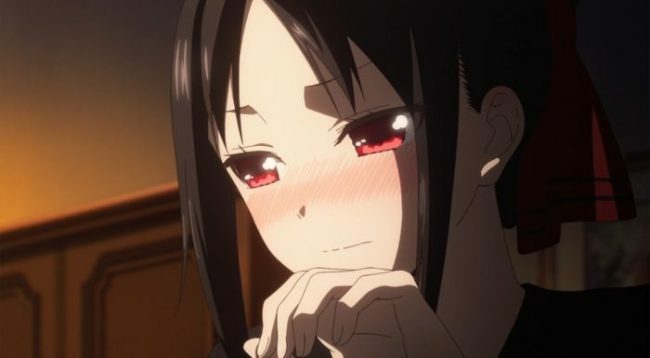 Kaguya Sama is this familiar story beat distilled into it’s most pure form and delivered with high impact. The progression of their relationship isn’t as glacial as that of a Shonen anime, Deku and Uraraka or Naruto and Hinata for example, but it’s moving in the same speed class. As the series goes on, Shinomiya and Shirogane do begin to soften to one another, slowly but surely making small gestures, despite their staggering pride always in the way. And the slow build of them taking the personal risks and reaching out to the other is exactly the thing that melts my heart. Seeing the pair stood under that umbrella well after the rain has stopped falling, to them just missing each other during summer break, right to the amazingly executed finale in which Shirogane makes the grand gesture of “rescuing” Shinomiya and getting her to the fireworks she was so desperate to see with her friends. It’s executed with a pitch perfect execution; the music, the visuals the drama. If it were notch more emotionally stable, I’d be blubbering like a little girl. It would have been the perfect ending to a show that really captured my heart. But then it’d buy it back, and I’d want to rip my hair out. Every time the pair come a little closer together, the show undercuts the moment before it can really settle. The finale is the prime example of this. I loved the ending of the firework’s scene so much, but there was still half of an episode left to go. In the most classic of anime style, both characters are incredibly shy, but totally unable to be open and honest with one another once the moment was over. And it’s not that the gags are bad either, because they’re not. The comedy in the show is executed well throughout, a combination of situational comedy and an over the top announcing assigning much higher stakes to anything that is necessary. As well as sweet moments that aren’t focusing the love battle between the main characters. But to end a series on this, in a way that takes us back the status quo between the two that existed at the beginning of the series. It frustrates the hell out of me. I grew to really like the show’s entire cast by the end, and would have loved to see the series end with some positive growth from any of the characters. Or at least some noticeable growth. Certainly, it’s within character for the pair to stick to their Olympian levels of stubbornness, with so much build-up and depth to these characters, I so badly wanted a more solid resolution to their story than the anime ended up providing. So much so that I took my lack of fulfilment out into the wilds and spend two solid days wrestling with something I don’t do all that often: The Manga. I tore through the manga like a ravenous beast, and was shocked to learn just how long this series still has to go, if the anime adaptation continues of course. Admittedly, if the main two characters do finally get together, then there would be no story to tell anymore. So I arrive at a crossroads. The entire premise around Kaguya-Sama is about building and building, and giving us a glimpse of what we finally want before snatching it away. Leaving us in a constant state of dissatisfaction. I’ve been struggling to avoid making the comparison between this and blue balls… but that’s kind of the perfect analogy. In the most recent story arc in the manga, it finally reached a place where Shinomiya and Shirogane seemed to have finally broken through their own pride and their barriers, to the point where they were finally going to get together. After the most insane romantic gesture from the president that was entirely befitting a couple as extra as these two. But then the manga artist, once again, pulled the rug from under me and veered the story in a utterly unforeseen direction. One that questions the validity of the pairing of the two in the first place. Shinomiya is shown to be gifted, intelligent and an incredibly capable person with a bright future. And yet, throughout the series as her feeling for the president become stronger, that strong and independent aspects of her character seem to fade, being overtaken by a weak-kneed, love struck little girl. It was so jarring that it made me question whether or not these two people truly are destined to be together in the long term. Ultimately this is all high school romance, as huge and important as the story does make it seem. I adore this series and the characters it has cultivated, growing its one note stereotypes into layered and complex personalities I want to see happy. But it also toys with my heart in a way that really just makes me realise what an emotionally messed up train wreck of a person I really am. Maybe it’s why I identify with them all so much. But there is only so much teasing I can take before my heart finally gives out. Relationships are important in media and to us in real life. As someone who recently started living alone, solitude really does make you realise how we need connections with other people to grow. And I hope Shinomiya and Shirogane eventually get the happy ending they want. Even if I’m an old man by the time that eventually happens. 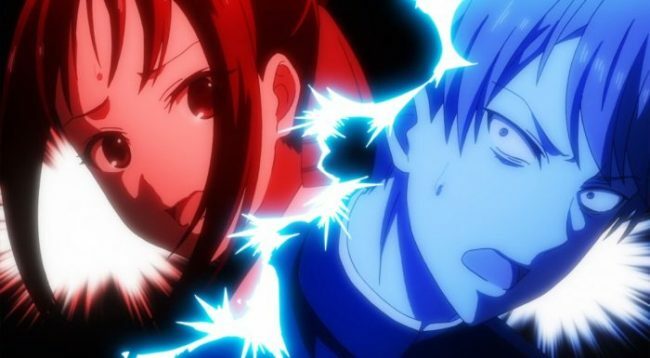 Posted on April 3, 2019 by WooderonPosted in Anime, My Thoughts on:Tagged Aka Akasaka, Chika Fujiwara, kaguya-sama, love is war, seinen, shinomiya, shirogane.